At Rope Services Direct you can buy cable socks of a number of different sizes, configurations and material types. We sell heavy duty and light to medium duty socks, along with non-metallic alternatives for specialist applications. 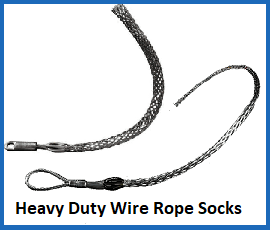 Read on to find out about the wire rope socks we offer and how to place an order with us. 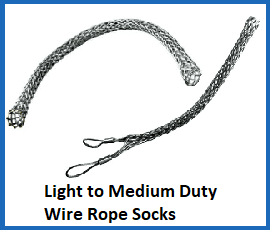 Our light to mid-duty cable socks can be selected in a variety of specifications, so you can pick the exact length, diameter and weave type to fit in with your needs. These socks will be capable of handling various safe load limits, starting at around 700kg and rising to over seven tonnes. Be sure to order the right type of sock, as otherwise you might fall foul of lifting regulations. With the heavy duty wire rope socks we sell, you can find sturdier assemblies with multi-weave lattice layouts that allow for might greater load capacities. These range from around three tonnes to more than 22 tonnes, allowing you to position and manoeuvre wire rope into position more easily, no matter how much weight it needs to bear. These socks are used across a surprising variety of different industries, including oil, mining and telecommunications. For uncompromising performance and unquestioned resilience, the heavy duty weave is your best option. 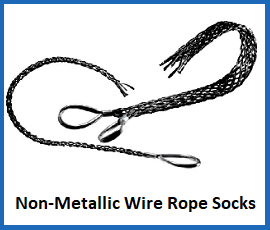 Wire rope socks that are fashioned from steel are obviously not ideal in every scenario, especially when electrical currents or combustible substances are present in close proximity. To this end we manufacture non-metallic wire rope socks that are still hard-wearing, flexible and versatile. Single and double weave versions are available, with different size ranges on offer and a single eye fitting typically found at the end. A non-metallic wire rope sock will have the added benefit of being resistant to corrosion caused by exposure to moisture in the environment, or even as a result of direct immersion in water. One of the biggest advantages of buying from Rope Services Direct is that we provide our customers with complete control over each order they place. You can personalise the specifications of almost any product on our site, from our synthetic and natural fibre ropes to our wire rope slings. We also stock a huge range of fittings and fixtures to help adapt existing rope assemblies, or to allow you to create your own setup if you would prefer. Whatever niche you occupy or use you have in mind, we can deliver the best wire rope products around. You can get in-depth details about our wire rope socks, or request a quote, when you call the Rope Services Direct team on 01384 78004. We can also be reached via email when you head to the contact page on our website. Don’t be shy, get in touch today! Cable Socks Overall rating: 5 out of 5 based on 6 reviews.